Born in Charlottetown, PEI., Milford played his junior hockey in the Manitoba Junior Hockey League with the Winnipeg Columbus Club and the Kenora Thistles. He turned down offers from the Detroit Red Wings and the New York Rangers in 1936 to play three years in England. He made hockey history when Eddie Shore traded him from Springfield to the Buffalo Bisons for two sets of used goal nets. 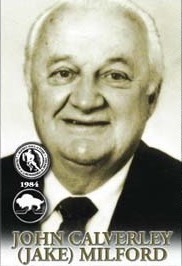 Milford coached in the New York Rangers system for 14 years, grooming future stars and championships. He became General Manager of the Los Angeles Kings in 1973 and took over the same position with the Vancouver Canucks in 1977 where some of his moves helped lead the club to the 1982 Stanley Cup final.